Micah Collier doesn’t know where his musical journey will take him, but he’s sure enjoying the ride. The 17-year-old senior at The Chicago Academy for the Arts already is a well-known upright bass player in Chicago’s jazz scene. He’s been playing at major jazz hotspots in the city and suburbs like The Jazz Showcase, Room 43, Andy’s Jazz Club, Norman’s Bistro and Winter’s since he was 14. “I’m always told to stay away from the bar,” Collier said while laughing. The Beverly resident has earned a scholarship to Berklee College of Music but has yet to make an official college decision. He also was recently awarded a National YoungArts Foundation Merit in Jazz Double Bass – given to the nation’s most promising young artists in the visual, literary, design and performing arts. Collier jokingly said he has traded sleep for music. He spends a full school day at The Academy, then as many as seven nights a week performing at Chicago-area clubs. He also plays weekly at the church he attends – Praise Alive Christian Center in suburban Calumet City. 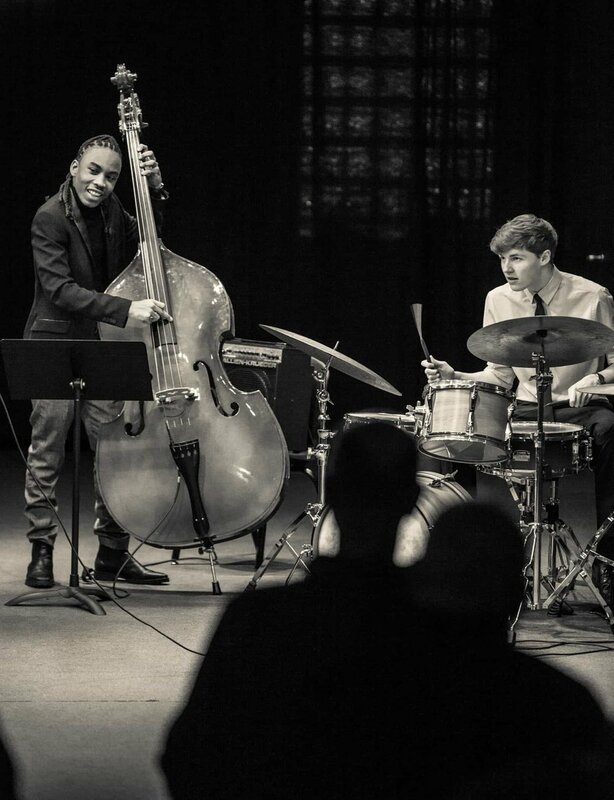 "Micah has made a name for himself in the Chicago jazz community as a sought-after bassist, and plays regularly at Chicago’s top jazz clubs, including Winter's, The Jazz Showcase & Andy’s, with some of the top musicians in town, which is an incredibly rare feat at his age,” said Rose Colella, Chair of The Academy’s Music Department. “He is also a joy to work with, in regards to the professionalism and dedication he brings with him to rehearsal, and in the sense of humor he brings to the department every day." "Micah is a very dedicated and talented student. With the right approach and consistent work over time he will be able to make quite the impression on the instrument. I have enjoyed his enthusiasm and desire to learn over our soon to be two years of working together. I look forward to hearing what he accomplishes in the years to come," said John Sims, Micah's bass teacher at The Academy. Collier comes from a strong musical family. His grandmother, Versoal, has been a longtime organ player at New Covenant Missionary Baptist Church on 77th Street. His father, Brian, is an electric bass player who inspired his son to start playing his own tunes when he was a seventh-grader. His entry to Chicago clubs came from his slightly older cousin, Isaiah, a saxophone player who was a regular in the local jazz scene and is now a student at Brubeck Institute in California. Collier said he was given no quarters for his young age, noting he was fired on the spot a few times because he wasn’t up to par with his playing. But he used that as fuel to improve on a daily basis. He gave credit to his parents – Brian is dean of students at Manley Career Academy High School; his mom, Colette, is vice president of school age and teen programs at YMCA – for his discipline and foundation. Until this month, when Collier finally obtained a driver’s license, his parents had been the ones taking him to his late-night gigs. Collier said playing music isn’t a job, but in fact a lifestyle. “This is what I was chosen to do,” he said. After college – he also has applied to Brubeck and several other prestigious music schools – he wants to return to Chicago, play professionally and help the next generation of dreamers. “I want to start a music school, get kids off the streets and teach them jazz,” he said.